My 1st introduction to Brighton was a weekend away in 1997 and I got eaten alive by bed bugs at a divey hostel. Not an auspicious start and little did I know that in 8 years time I would return to live in the city I now call home. After reading quite a few blogs on Brighton from people who visit I decided this year to write an A-Z of Brighton and the surrounding area of Sussex. This is the 1st post introducing Brighton for people planning on coming to visit this lovely city. Brighton and Hove is a seaside city located in East Sussex with a population of 273,000. A fast train from London Victoria will take you under an hour to get to Brighton and Gatwick Airport is also half an hour by train. From the South Downs with the Devils Dyke to the coastline with Seven Sisters chalk cliffs or the famous Brighton Pier and Royal Brighton Pavilion or the crazy night life and great restaurants and world-class venues for entertainment, I suggest the top 3 places you should visit are the Royal Brighton Pavilion, Brighton Pier and exploring the narrow lanes, especially, if you’re a 1st time visitor to Brighton. Debbie, my Canadian/UK wife has lived in Brighton for 20 years and I have lived here 10 years. Between us we have 30 years of experiences living by the seaside in Brighton. Before that I was living in Amsterdam for 2 years and prior to that New Zealand. Debbie lived in Germany and Canada. We are often asked why we do not live in New Zealand or Canada – New Zealand we both love going for holidays but neither of us want to live there permanently and Canada, well, we are looking to build a life there and maintain our life here, but more about that later. There are many reasons we like living in Brighton and Hove, which is the correct title of the city since Hove was amalgamated into Brighton many years ago. The great lifestyle, beach, friends and the weather is surprisingly excellent because of the micro climate. Brighton is wedged between the South Downs and the English Channel which produces a great climate most of the year. Brighton at Christmas is also a lot of fun, click on the link for more info on that. All of this adds to why 8 million people visit annually for day trips or a weekend. According to Tripadvisor Brighton is #1 of the top 10 destinations in the UK to visit. Famous throughout the world is the iconically designed Royal Brighton Pavilion. 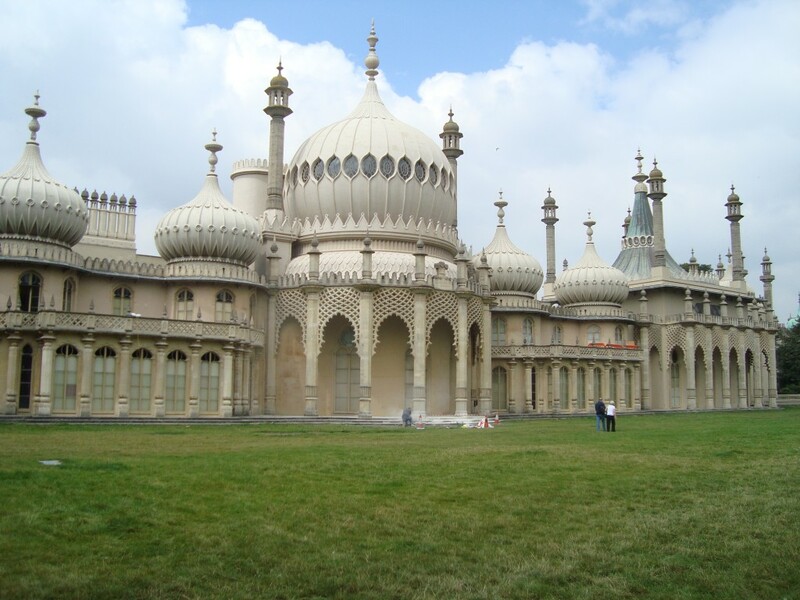 John Nash, was commissioned by George IV, to build the Royal Brighton Pavilion. It was completed in 1823 with its domes, minarets and towers. The Pavilion was unique with its combination of Chinese, Turkish and Eastern influences. George IV was a man who liked the good things in life: food, entertaining, horse riding and collecting art/furniture from France, China and India, so throughout the Pavilion, in different rooms, are a treasure trove of different collections. Brighton Pier is a step back in time to the Victorian age where the main attraction when visiting the seaside was the pier. The 1st pier was built-in 1823 and called the Old Chain Pier and was used for disembarking passengers from Dieppe. Entrepreneurs saw the money to be made from the passengers and kiosks and amusements were built. In 1889, a storm completely destroyed the pier. 10 years later the new Brighton Marine Palace and Pier was opened. The last refurbishment was in 1984 and nowadays, the pier has not lost its allure. Whether you just take a stroll along the pier or enjoy the amusement park at the end, the Pier is some good nostalgic fun. I personally would eat elsewhere as the deep-fried food will solidify any artery and guard your chips as there is a constant chance of a sneaky seagull stealing the chips or any food you choose to buy. The Lanes are a collection of narrow alleyways to explore and shop till your heart is content. The Lanes are famous for their quirky and unusual shops to explore as well as some great restaurants to enjoy a snack, lunch or dinner. Afterwards you can be scared with the ghost walk of the lanes a 70 minute stroll visiting and hearing about the ghostly past of Brighton. Have you been to Brighton? What was your favourite memory? We live just north of the downs having moved out some years ago. It’s a great place. Relaxed and friendly. I would highly recommend the North Laines on the weekend plenty of street life and some nice cafes and some awesome pubs. We love eating at Pinochio Italian near the Pavilion. Friendly and well priced. If you have time, take the bus to Rottingdene (sp?) and have a walk by the sea and rock pools. Obviously, all of this is better if the sun is out. It’s North Laine by the way. It’s a common mistake many people make. North Laine is always referred to in the singular. It’s an Anglo-Saxon word for a smallholding or plot of land. This area was, at one time, divided up into small plots. It has nothing to do with the common noun ‘lane’, as in a small passage, or what one might refer to in Sussex vernacular as a ‘twittern’.